We will allow time for settling bills and packing cars, before starting the walk from the hotel. We hope to be walking by 0945. Today's walk is a circuit of Rydal Water. It is not too demanding, but there are two shortcuts which can be used if the weather is poor, or if some people want a shorter walk. We start by crossing the road and then the river. Here we have a choice of going up the hill as shown on the map, or taking an easier route to the right along the lake shore. The higher walk does, of course, give the better views, but is a little more demanding. 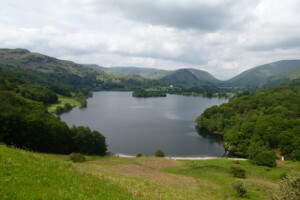 The routes join at a point above Rydal Water and Grasmere, where there is again a choice. The full walk takes us along Loughrigg Terrace, which has one of the best-known views in the Lake District, before descending on an easy path to the shore of Grasmere. The shortcut drops somewhat more rapidly to the shore, and has a slightly awkward bit at the bottom. We then pass through the woods of the Lowther estate, where there is a toilet block. After this, we climb fairly steeply to the Coffin Path which connected Rydal to the church at Grasmere. We follow this back to the hotel. Click for a map of the walk. There is a café at Rydal Hall, but it might not be able to cope with us all at once. Some people might prefer to set off immediately for home and stop for lunch on the way. © Copyright D S Pugh and licensed for reuse under this Creative Commons Licence.